Almost everyone talks about what an awful year this has been in some manner or another, but Nintendo is doing everything in its power to buck the trend. Case in point: Not only has the beloved game company been releasing critically acclaimed games left and right, but it also just announced that it’s already sold 10 million units of its new Nintendo Switch console. The latest financial report is a fascinating glimpse into how effective Black Friday and holiday sales can be, especially when coupled with a quality product. Back at the end of September, the company had “only” sold 7.63 million units since its March 3 release date, but that number soared up to the current figures in the last quarter alone. The sales are especially impressive in relation to 2012’s Wii U, the Switch’s predecessor, which only moved 13.5 million consoles over the course of its entire lifespan. According to some analyst's predictions, the Switch might completely eclipse the Wii U's sale numbers in just another month or two. 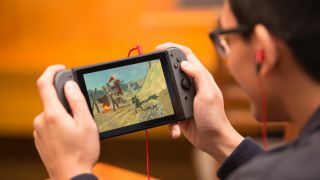 As a downside, the new console still has 4 million more units to go before it reaches Nintendo’s revised sales projections from October, but there’s still time to pull it off as the fiscal year won’t end until March. Black Friday may no longer be around, but Christmas is still on the way, and sales could further grow on reputation alone. For its part, Nintendo is preparing. “This December in Japan we are planning to ship more units than ever before so that even more consumers can purchase and enjoy Nintendo Switch,” Nintendo said in a prepared statement. The latest financial report also included news about games sales, which are similarly impressive. The Legend of Zelda: Breath of the Wild remains the most popular title with 4.7 million copies sold, while Mario Kart 8 Deluxe isn’t far behind with 4.42 million copies sold. Taking third place was Splatoon 2, of which 3.61 million copies were sold. For comparison, Sony announced back in 2014 that after around 10 months on the market, it sold around 10 million PS4s - around double the amount of Xbox Ones sold in the same time period. These are the best Nintendo Switch games available to play right now!